Belle View near Frosterley, County Durham sleeps 3 people. Belle View near Frosterley is ideal for those searching for a peaceful holiday destination; Belle View is the perfect holiday cottage to choose. 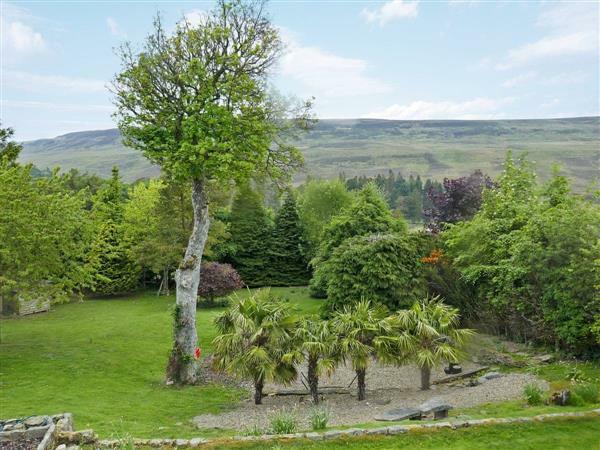 Attached to the owner’s home, and sitting high up amongst the hills and valleys of scenic Weardale, Belle View offers a comfortable retreat with breath-taking views over the North Pennines Area of Outstanding Natural Beauty. Perfect for guests wanting to enjoy a quiet couple’s retreat, or a peaceful escape from the hustle and bustle of everyday life. Ideal for small families too, there is plenty of space throughout. On the ground floor guests will find a well equipped kitchen with a variety of appliances including electric hob and oven, fridge/freezer, washing machine and dishwasher. The open plan living/dining room is spacious, light and airy with super views across the dales. On the first floor there is a well-presented double bedroom that boasts even better views across the surrounding countryside, and a separate single bedroom that is equally well-presented. The family bathroom offers excellent fixtures and fittings including a bath and over bath electric shower. There is private parking for two cars to the rear of the property and also garage space for guests to store their bikes away. To the side of the property is a small and private garden area that leads down to the larger garden belonging to the owner. Guests are encouraged to make use of the whole garden and to feel like they are visiting a real home from home. The views from the living area and bedrooms are stunning, and it is perfectly located just minutes from the Weardale Way. Walkers, cyclists and nature lovers will find the area the ideal destination for a leisurely stroll or a more energetic and taxing walk along one of the many established public footpaths, and cycle paths, that lead right from the area and through some breath-taking countryside and riverside locations. Often referred to as “England’s last wilderness” and most probably one of the North East’s best kept secrets, the Durham Dales are situated in an Area of Outstanding Natural Beauty and consist of rugged upland, mighty waterfalls, fertile river valleys and wild flower meadows. For the guests who like to feel close to amenities, the pretty village of Frosterley is just over two miles away and boasts a number of shops and local pubs serving excellent food and popular local ales. A little further afield, but still within easy driving distance, is the popular town of Stanhope, which houses the Durham Dales Visitor Centre and is on the Coast to Coast Cycle route. Killhope with its lead mining museum, Hamsterley Forest with its popular walking paths and bike trails, Barnard Castle, Bishop Auckland, and many quaint villages that dot the landscape including Wolsingham, Crook, Sunniside and St John’s Chapel can all be reached by car in less than an hour. The Cathedral City of Durham is only 18 miles away and can be reached in a 35-minute drive. Beamish living museum is definitely worth a day trip and can be reached within a 45-minute drive. Newcastle-upon-Tyne and The Metrocentre are both within an hour’s driving time too, and offer a variety of attractions including The Sage, The Centre for Life and one of the UK’s largest shopping centres. To the north, guests will be able to explore the historic sights and settlements of Northumberland including Hadrian’s Wall, Vindolanda and Chester’s Roman Fort, and to the west is the county of Cumbria and the Lake District National Park. The beach is 35 miles from Belle View near Frosterley. With the shop, pub and restaurant 2 miles from Belle View. Living/dining room: With electric coal-effect fire, 43 Freesat TV, DVD/Blu-ray player and Wii. Bedroom 2: With single bed and sloping ceiling. Oil central heating, electricity, bed linen, towels and Wi-Fi included. Highchair. Welcome pack. Large, enclosed lawned garden with patio, garden furniture and barbecue. Bike store. Private parking for 2 cars. No smoking. Holidays at Belle View run from Friday to Friday. Pets allowed at Belle View. For a better idea of where Belle View is, you can see Belle View on the map below. Belle View is in Durham; should you be on the lookout for a special offer, you can find all the special offers in Durham. It's always worth checking to see what is on offer at the moment. Do you want to holiday near Belle View (UKC3047), you can see other cottages within 25 miles of Belle View; have a look to find your perfect holiday location.